Sammy & Coltons wintery Cameron Pass Engagement Session wasn’t supposed to be ‘wintery’ at all. Leading up to their date I kept a close on the weather. Knowing we will be about 11,000 ft in elevation, the weather can change hourly. Party cloudy and a little chill is what was on the weather forecast for their engagement session. This was perfect. As I drove up the canyon to beautiful Cameron Pass, the sun was shining and not a cloud was in the sky. I did get a little worried driving up the canyon, thinking we may not have shade to hide from the bright sun. About 10 miles away from the top of Cameron Pass, I could see the clouds rolling in. I started to get excited knowing I will have shade to shoot Sammy & Coltons engagement session in. That excitement of shade turned into white knuckle driving as I began to approach the top of Cameron Pass. I was a few miles out from the top of the pass and the snow came in strong, like a blizzard. The wing was blowing, the snow was falling and the piles of snow were up to the top of my car. When I arrived to the meeting location, the snow was DEEP. I started to get a little worried where we would be shooting. Colton & Sammy arrived and we discussed the weather situation. They were stoked to see the snow as they were hoping for a snowy engagement session. I bundled up in snow pants, winter hat and gloves while these two braved the cold to capture their session. Thankfully, when it is snowing, you can shoot pretty much anywhere, and still make them look amazing. We had fun in the snow, trying to keep warm, and in the end, the session was absolutely perfect. 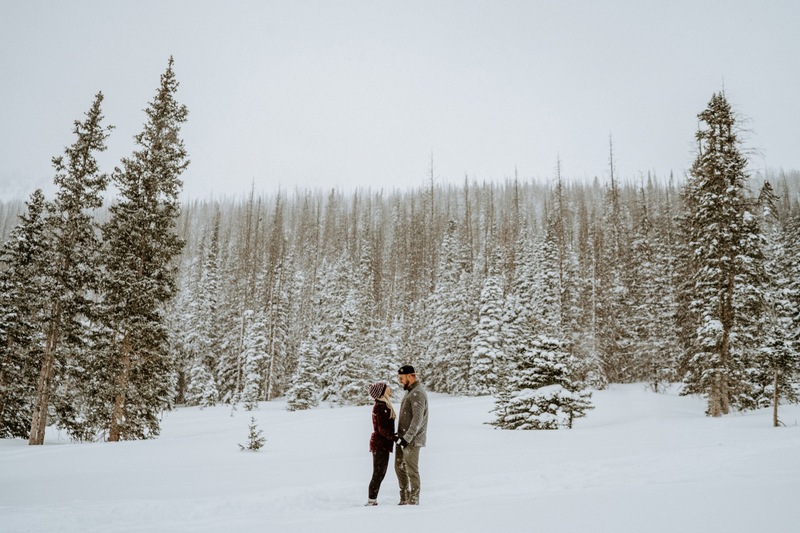 Here is a little peek into Sammy & Colton’s wintery Cameron Pass Engagement Session. I hope you enjoy these images as much as I do.